Looking at Things From Another Point of View: Do We See Distinctions That Make A Difference? Sometimes when you are weighed down by concerns you want to try considering an opposite point of view because you really hope that doing so will change what you were thinking. We have been enormously worried about Rupert Murdoch's purchase of the Brooklyn Paper and what it means for coverage of Atlantic Yards and other local development stories. • The Bronx Times and The Bronx Times Reporter. • Times Ledger newspaper group in Queens. • Courier Life group in Brooklyn (28 weekly papers, 27 of them geared to covering specific neighborhoods). Our last post worrying about the change in the Brooklyn Paper’s ownership was Tales of Two Landlords Bridged by an Iconographic Clash (Saturday, March 21, 2009) wherein we also focused worriedly on the fact that the Brooklyn Paper’s new landlord is Forest City Ratner. In it, we wrote about how, Forest City Ratner has appropriated an iconographic view of the Brooklyn Bridge in its advertising (as Norman Oder of Atlantic Yards Report pointed out) which, ironically, just happens to be the same view of the bridge that another developer, the Walentases’ Two Trees Management, now proposes to obliterate with an outsized new building known as the Dock Street Project. Undergirding this irony is that while Ratner will be the Brooklyn Paper’s new landlord, the Walentases were, until this point, the paper’s landlord and it has been asserted that this fact has slanted the Brooklyn Paper’s reporting more favorably toward the Walentas project. In a very similar way we had the chance to try on a different point of view about whether our concerns for the Brooklyn Paper are real, and in quite the same way we found ourselves coming out in the same place as before. In a stupendous piece of reporting last week, (Wednesday, March 25, 2009, Gersh speaks! Award-winning Brooklyn Paper editor answers (sort of) questions about new Post parent, Courier-Life sibling) Norman Oder presented an 11-question interview with the Brooklyn Paper’s editor Gersh Kuntzman. The questions, presented and answered by email, were, as preagreed, followed up on by Mr. Oder. Knowing how assiduous Mr. Oder is, no one should agree to be bookended by him, questions first and follow-up answers after, unless they are prepared to be absolutely straightforward. If you are concerned about good journalism in the borough of Brooklyn the interview is an essential must read. We would do a disservice to quote so much of it here that you think needn’t read it in full. When you do read it, click on all the links and spend time with them. Among other things, by doing so you will be reminded what excellent journalism the Brooklyn Paper has provided up to this point. It should be clear that we share the concern made in a prediction by Mr. Oder “that The Brooklyn Paper’s news coverage of Atlantic Yards will diminish somewhat (as it already has), and its editorial criticism will diminish even more.” In theory, Mr. Kuntzman by being interviewed offered us the opportunity to take in another viewpoint. In fact, reading the interview led us to conclude these concerns about the paper’s future are absolutely valid. He was, of course, correct. When the week’s edition of the paper came out Thursday there was an article by Mr. Kuntzman himself on the front page, its headline a trifle confusing, Weary Gehry Leery, Then Turns Cheery: Architect was `misconstrued’ about Yards. The current headline on the paper’s website is different: Gehry says he was ‘misconstrued’ over predicting Yards demise (March 26, 2009). - - We focus on the headlines because that is often the extent of what people take in.- - The text of the Brooklyn Paper article played out as a sort of he said/she said story. (Mr. Oder referred to the Gehry remark as “a bombshell.”) Reading carefully you could detect a jaundiced skepticism as architect Gehry carefully corrected his truth-based “gaffe” in parsed-out public relations terms, and as developer Bruce Ratner tried to spin that into something more favorable. The paper was working from “a statement issued by his [Gehry’s] Los Angeles-based firm.” Develop Don’t Destroy and the opposition was given a credibly generous amount of ink before the article was through. Where does this lead? A trait we have noted with Mr. Kuntzman and which comes through in the Oder interview is that he often spars with an antic humor that keeps others off kilter, sometimes experimenting with a feigned insincerity that may not always be entirely mock. We wonder if we will see more of this from him, which will for a while make it more difficult to identify the ongoing changes at the paper. Notwithstanding, Mr. Oder has done a superb job of pinning down where things are apparently heading. Back to Port With Dock Street? The School Construction Authority was not being honest last June when it stated publicly that it did not “identify a need” for a new middle school in Brooklyn Heights or DUMBO because the comment came while the agency was in the midst of negotiating with a DUMBO developer to build just such a school. That’s the most stunning news buried in dozens of pages of just-released documents made public by the SCA after a freedom of information request by Councilman David Yassky (D-Brooklyn Heights), who is an opponent of a project by David and Jed Walentas of Two Trees Management to build an 18-story tower and public middle school on Dock Street near the Brooklyn Bridge. “It’s always troubling when government agencies, which are accountable to the public, are doing one thing in private yet saying something else in public,” said Yassky. . .
That’s tough on the peculiar politics of the Dock Street Project, but the Walentases are not the paper’s landlord anymore. The following coincidences are therefore unnerving. The School Construction Authority until recently used to say that the neighborhood did not need a new middle school. Now the School Construction Authority has suddenly backed the idea that there should be a new school in precisely this spot and precisely in this building. 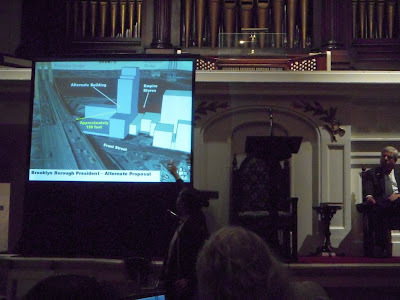 Next, testimony at the hearing by Historic Districts Council President Paul Graziano made clear, with the use of a map, that while there is a confluence of designated landmarks and historic districts where the project is proposed to go, there is also an ominous hole in their contiguity that surrounds the project site. Creating such an absence of historic designation takes a certain amount of political artistry. The Oder interview gets into coverage of the Delia Hunley-Adossa candidacy to unseat City Council Member Tish James as a gauge of the extent to which the Brooklyn Paper will be adequately covering Atlantic Yards (see question #8). Tish James is a stalwart Atlantic Yards opponent. Stripping away the trappings of a phony community-group “charity” Ms. Hunley-Adossa is essentially an employee on the Ratner organization’s payroll. The Brooklyn Paper hasn’t covered this attempted developer takeover of local politics and the non-coverage is a good gauge of what there is to be concerned about. The depth of concern about the Brooklyn Paper's coverage is not as apparent from the interview as it is in another extraordinary piece of reporting Mr. Oder did two days later, thereby setting the bar. (See: Friday, March 27, 2009, Behind Hunley_Adossa's campaign, treasurer Nimmons heads another dubious nonprofit, with Ratner funding.) The Brooklyn Paper has heretofore run some very important stories about the abuse of charities for political purposes, but this article of Mr. Oder’s is leaving them in the dust. While The Brooklyn Paper hasn’t yet covered the Hunley-Adossa campaign, the Brooklyn Courier with which it is likely merging is covering that campaign involving the Atlantic Yards developer’s extreme abuse of charities as if it were an ordinary campaign and one that the challenger is "winning." Mr. Oder is on hand to tell us more about this. (See: Saturday, March 28, 2009, "Dee raises more than Tish" and other reasons for more journalistic voices (plus a new 35th District candidate.) By remaining silent the Brooklyn Paper is allowing its confederate sister paper to report PR manipulations as actual news. . . It is a story about an election that is months away. Besides, Delia has not raised a DIME yet, which is typically our standard for determining whether a candidate merits coverage. Our lack of coverage of Hunley's longshot campaign should not be interpreted to mean anything — though you, no doubt, will continue to interpret to mean everything. As noted, by weeks end the sister Courier was uncritically reporting that Delia had not only raised Kuntzman’s proverbial dime but had `outraised’ Council Member Tish James. We think there is a story to report here: Part of the story is the Courier’s uncritical coverage and another part is the Brooklyn Paper passivity while its sister paper engages in that unbalanced journalism. At the heart of the Hunley-Adossa Campaign story is the subject of abuse of charities for political purposes, which is an absolutely critical one in the city these days. See our own: “Charity?” We Begin to Groan (Monday, October 20, 2008) and we have written more on the subject. At the moment it is difficult to say how many in the next cycle of elections will turn on the issue, including the mayoralty campaign. Real estate developer funding is frequently a big part of the charity abuse picture, but Mr. Oder may have documented a direct abuse of charities by a developer for political purposes that is more blatant than anything seen before. It is not on the scale of what goes on in the case of Mayor Michael Bloomberg, the city’s richest individual, but it must command attention when such abuse takes off initiated by a developer (and his faux charity) with no pre-existing politician helping to instigate it. Here the abuse generates the politician rather than vice versa. We hope the IRS wakes up and takes notice. We hope that the Brooklyn Paper decides to cover these things before the IRS wakes up rather than afterward. We said at the outset that with the Murdoch takeover of the Brooklyn Paper and other local papers, we were worried about coverage of all Brooklyn real estate development. Truthfully, you should be able to tell from what we just said that we are worried about coverage of real estate development throughout the city by all of the media and, beyond that, we are also worried about coverage of the political process in the city as a whole. We had our concerns. We read Mr. Oder’s interview with Mr. Kuntzman and we think we have considered Kuntzman's alternative point of view. But considering that alternative point of view has brought us back to the same place. We are still concerned. And yes, there is also that thing called “hope.” We can hope that our concerns are unfounded. Hope aside, we know that there is a critical role for good journalists to be playing in this city right now. The question remains: Who is going to do it? This is a to take note about questions we hope are going to being asked about the whereabouts of AIG executives after they leave AIG. Asking the questions would seem to be imperative given what we view as the patterns of self-dealing in which AIG executives have been involved. As people closely following the scandal know, AIG has been routing federal bailout money around the world and to Wall Street, essentially buying favor with big firms and banks by unnecessarily paying 100% on the dollar to extinguish collateral obligations which should have been extinguished with much lower negotiated discount sums. This has turned into windfall infusions of cash, a counterintuitive reward for financial companies who (foolishly?) placed their bets on AIG’s unregulated derivatives and CDO division being sound. AIG’s undiscounted billions of dollars in payouts to banks like Barclays are an example of how poorly managed the AIG government subsidies are, but people probably understand the problem reflected in the case of the AIG “retention bonuses” better. Our Two Cents: The Atlantic Yards Analogy- Who says You Get to Clean Up the Big Messes You Make? The AIG executives’ payout of 100% on the dollar to extinguish collateral obligations that should have been extinguished with much lower negotiated discount sums demonstrates that keeping such executives in place doesn’t work. It is far better to clean house. If AIG had gone bankrupt, the trading partners, known as counterparties, could have received as little as 20 or 30 cents for each dollar owed. Instead, thanks to Uncle Sap, they got paid in full. He might also have added that any payout of collateral that occurred was only necessary because AIG was having financial problems. The recipients of the 100% on the dollar payout of collateral, like Barclays or Goldman Sachs, shouldn’t be able to have it both ways: Payment of collateral triggered by AIG financial difficulty and then complete and total insulation from that difficulty entirely at U.S. taxpayer expense. Being Alert for Self-Dealing, the Questions We Think Should be Asked: Where Are They Now? Having initially focused on the AIG executives’ self-dealing bonuses, we hope that Attorney General Cuomo remembers to be alert for self-dealing on these 100% payouts. Here is the question we hope everyone will be asking. Not all the AIG executives who received retention bonuses remain at AIG. Where are those executives now? Or where will they be not long from now? Additionally, where will the executives who have yet to leave AIG go? Will we find these executives at the Goldman Sachs and Barclays or any of the other banks and financial institutions that received these 100% payouts? Attorney General Cuomo has wavered on whether he will be making the names of the AIG bonus recipients public. It is not the names of the bonus recipients we want to know so much as where the executives involved in the 100% payout decisions have gone. Without knowing who they are and where they are now, it will be hard to know what kind of self-dealing there may have been. 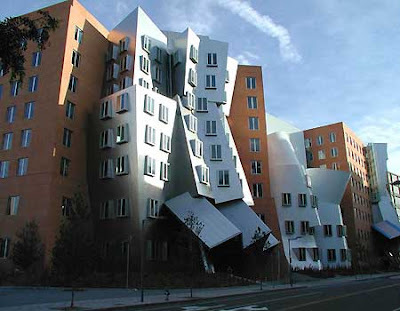 Adding to the List of Gehry Projects With Leak Problems: The MIT Stata Center . . . 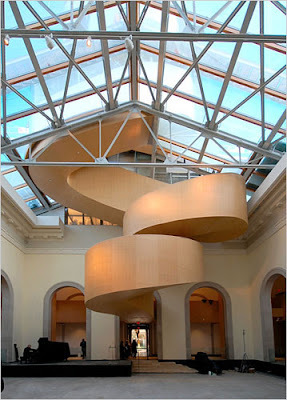 The leaks and condensation problems at the AGO have dredged up memories of a negligence lawsuit that ensnared its architect, Frank Gehry, in late 2007 after another of his designs, at MIT, became cracked, leaky and mouldy. 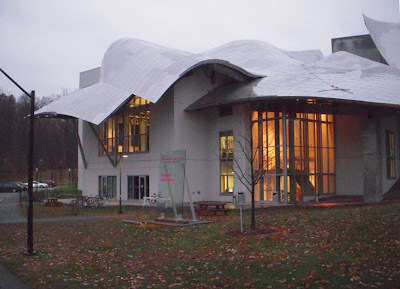 . . . . there was a problem with the five-year-old roof because Gehry’s design specifications did not take into account the variability of the climate. “value engineering” — the process by which elements of a project are eliminated to cut costs — was largely responsible for the problems. Gehry thinks that “value engineering” results in problems like leaks- - at least when it comes to his own designs. So? . . . . In the early 1990s Frank Gehry and I took a drive down the city’s once-great commercial spine, which stretches 16 miles from downtown Los Angeles to Santa Monica. Mr. Gehry guided me through the range of communities that the boulevard intersects, from the Latino neighborhoods near MacArthur Park to Koreatown to the many cultural institutions that include the Wiltern Theater, the Los Angeles County Museum of Art and the Hammer Museum . . . . Dealing with the challenge of local climates seems to be a problem for Mr. Gehry. In theory, it shouldn’t have been a problem for him to remember to take into account the climate in Toronto where the art gallery is now leaking even though it was his first commission in his hometown. 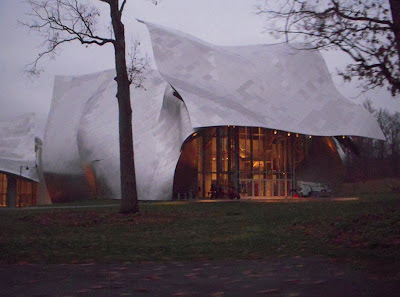 Mr. Ouroussoff stressed, in his review of the art gallery, how significant it must have been for Mr. Gehry that the commission was in his hometown. 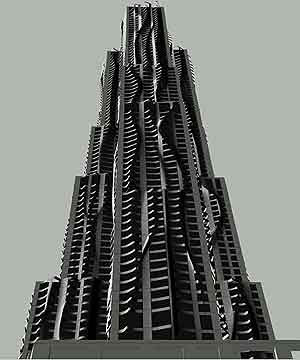 On the other hand it was Gehry’s first commission in his hometown. It is not just inclemency and seasonal cold that is a problem for Mr. Gehry. Even in LA he had problems where the skin of his Disney Concert Hall had to be abraded because its reflection of too much concentrated sun created a problematic amount of heat on the walkways outside. Should a Predication Be Made? But it was the leaks that got us thinking about the Beekman before there was news of its most recently revealed problems. Thinking of these leaks we were looking at the Beekman and wondering just what will happen when it is built. Here is prediction that somebody should perhaps be making about the Beekman. Have you watched the way water runs down mountainsides in a heavy rainstorm? Look at how the Beekman facade has channels that will collect rivuleting water into expanding streams, especially when pushed around by wind. We really can’t help ourselves; we are expecting that there may be water problems at the Beekman. As water cascades down the side of the building where will the water go? Leaks into the building’s interior may not be the only problem. That’s what we were thinking before word came out that the Beekman may be redesigned and built at only half its originally planned height. Where are we now? All we can say is happy value engineering! Of course, we don’t know. We haven’t studied the plans and specifications for the building. We have not asked the engineers questions and we are not engineers ourselves. In fact, we don’t even know what is ultimately going to be built. But when Ouroussoff was lauding the Toronto Art Gallery did he expect it to leak? Did MIT expect their leaks or Bard College theirs? 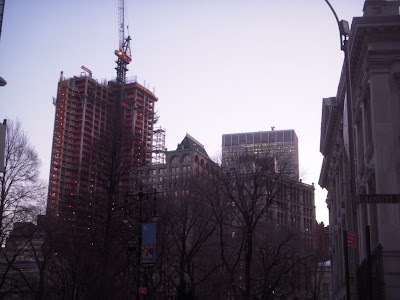 Whatever gets built, a short Beekman or a tall one, perhaps we should all make a date to visit the Building and see what is happening to it the first formidably inclement day after it is officially complete. We plan to bring an umbrella. In a moment we are going to circle back to the huge precedent-setting advertisement that Forest City Ratner ran (full page) on the back of this week’s Brooklyn Paper. (See: Saturday, March 21, 2009, Sign of the times: Forest City Ratner buys welcome ad in the Brooklyn Paper.) First we have to explain a few things. “I’m going to go out on a limb here and predict that The Brooklyn Paper’s news coverage of Atlantic Yards will diminish somewhat (as it already has), and its editorial criticism will diminish even more,” wrote Norman Oder, a critic of the development, on his blog Atlantic Yards Report. This problem of who is the Brooklyn Paper’s landlord reminds us of another of its landlord problems that people have been worrying about recently. This problem also has to do with unwanted real estate development, the Dock Street project which is proposed to be put next to the Brooklyn Bridge. We note that we often place much stock in the reporting and positions of the Brooklyn Paper and that the Brooklyn Paper is editorially supporting Dock Street (see the link above). We also note that those opposing the project have pointed out that the Brooklyn Paper is a tenant of the developer. As the Brooklyn Paper is moving into Ratner premises at MetroTech, David and Jed Walentas, the developers of the Dock Street project, will no longer be the paper’s landlord but, critically, they were when the issue was in play. 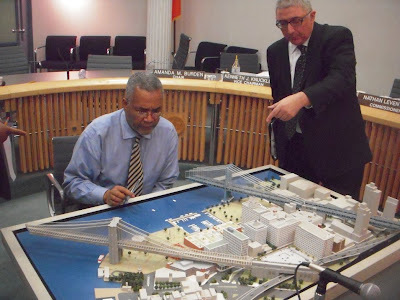 At the CPC hearing, pages of the Brooklyn Paper were introduced into testimonial evidence as substantiation for the supposition that the Dock Street project would not deleteriously detract from the public experience of seeing the bridge. We noted above that the paper editorially supported the project. 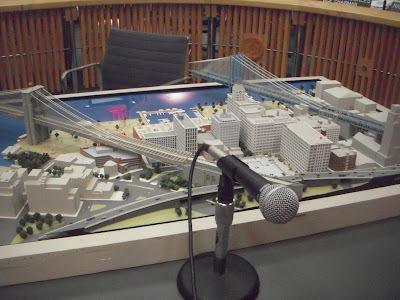 Pro-Dock Street testimony was delivered that averred that investigative reporting by the paper also substantiated the fact that the “iconic” views of and from the Brooklyn Bridge would not be impaired. That pro-project testimony was thereupon followed up by testimony from those opposing the exceptionably large project pointing out that the Brooklyn Paper’s position and reporting were suspicious and ought to be discredited due to the fact that the Walentases were the paper’s landlord. 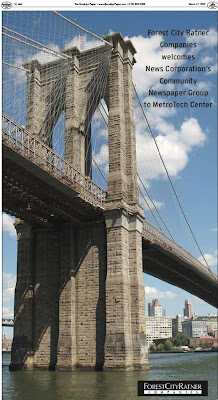 As a commenter notes, the advertisement portrays the Brooklyn Bridge, which happens to be closer to the Brooklyn Paper's longtime DUMBO offices, rather than the generic MetroTech office park. There it is! 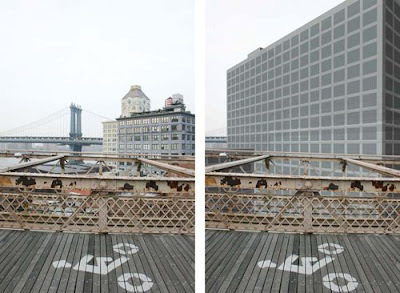 That iconic view of the Brooklyn Bridge so important that Forest City Ratner has on multiple occasions used it, passing up other opportunities to more accurately represent itself. The interesting thing is that the view of the Brooklyn Bridge in the Brooklyn Paper’s Forest City Ratner advertisement this week is almost exactly the same view of the bridge that the Dock Street opposition has pointed out, using visuals (such as that below) is about to be sacrificed if the Dock Street project is ever built. Willets Point Lawsuit Points Out . . . This post discusses the lawsuit, particularly its challenge to the city’s indefinite and supposed “public purpose” in condemning Willets Point. 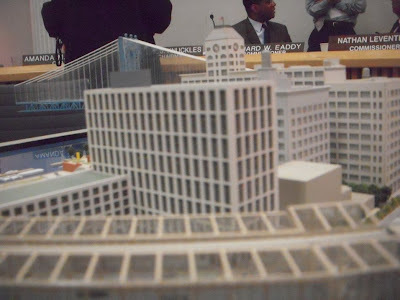 For reasons which will become clear, we venture in our discussion to consideration of another city administration supported megaproject, Atlantic Yards, and we also give some attention to the AIG scandal tumult. We suggest you sit back for the adventure. The plaintiffs brought their petition against Mayor Michael Bloomberg, the New York City Council, the City Planning Commission and Deputy Mayor Robert Lieber. The filing of this lawsuit provides an updating chapter to the (four-part) story we told about Willets Point in Will It Come? What the Bloomberg Administration Wills at Willets Point (Thursday, December 4, 2008). We were pleased when No Land Grab described our series as a “must read that contains information and analysis that you'll never find in the mainstream media.” The lawsuit’s point of view accords with the analysis we provided in our Will It Come series. We note we intended that eries to provide a neutral analysis of what is going on in Willets Point. The actions of the city have already brought harm to the residents of Willets Point. Even so, the suit’s challenges to the environmental review point out that for various reasons it remains to be determined that anything approximating what is being talked by the city is practically achievable. In our Will It Come series we were similarly inclined to think that the city’s vision seemed more than a trifle “starry-eyed.” Would that we had used the phrase. It occurs to us that the city is attracted to these “starry-eyed visions,” Atlantic Yards being another example, more as an excuse to transfer huge tracts of land from many small owners into the hands of single-developer monopolies. After such transfers, what the project will actually turn out to be then depends upon those monopoly developers. Given the time frames involved what these developers may thereupon build is highly speculative. In the meantime, each generates a giant hole in the ground. In fact, given the 30 or so years it may likely take to fill holes created for either the Willets Point or Atlantic Yards megadevelopments, it is highly speculative that the developers to whom the monopolies are given will be around. Case in point: Forest City Ratner, the developer for Atlantic Yards and one of the developers the city was considering for Willets Point. 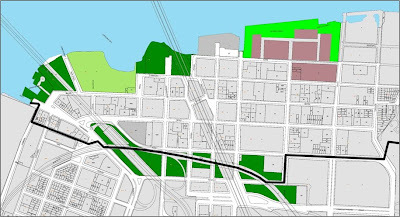 The city determined to give Forest City Ratner a bidless monopoly for Atlantic Yards back in 2003. The project has not yet broken ground. Yet already, in the fraction of the 30-year time horizon the megaproject might take, it appears that the developer is very likely to financially succumb and go out of existence. When it does, the definition of what the project is supposed to be essentially disappears with it because the project seems to be little more than what Forest City Ratner has from time to time decided to define it as. As for the financial demise of Forest City Ratner, we think that it couldn’t happen to a subsidy-seeking company that deserves it more. For more on the pending financial demise of Forest City Ratner see: Tuesday, March 17, 2009, Three months later, Morningstar again says Forest City Enterprises stock is worthless, Thursday, March 12, 2009, Purchase of FCE bonds, sale of FCE properties suggest corporation faces unsteady fate, March 11, 2009, Forest City in the News: Financial Straits Edition, March 16, 2009, Forest City in the News: Financial Straits Edition, Forest City Enterprises, Short on Money, Abandons Fresno Project, 3.14.09, and reporting on a Cleveland Crain’s article, Forest City Enterprises Dumping the Good Stuff Into a Bad Market, 3.17.09. Beekman Symbolizes . . . . ? One wonders. 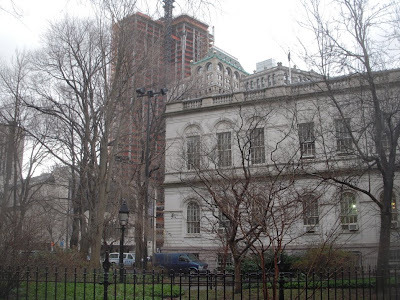 It is amusing to toy with the idea that the building might have been stopped by the mayor himself when he realized how the immensity of the building in his own City Hall backyard might stand as a symbol to influence the debate over his administration’s sell-off of the public realm. (See: Monday, February 23, 2009, Un-funny Valentines Arriving Late: Your Community Interests at Heart.) Realistically, however, we must conclude that this is just a stark example of Forest City Ratner’s reversal of fortune. The emerging story of the Beekman, just one building, reminds us what we should always remember: Things change. The bigger and more long-term the project, the bigger the potential for changes. 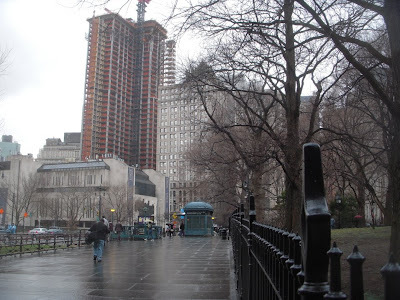 When Battery Park City started construction of its first buildings in 1980 all of its residential construction was supposed to be middle-income housing. 30 years later, with Battery Park City almost completed, only a minor fraction of it is middle-income or affordable housing. It doesn’t even require the bankruptcy of a company like Forest City Ratner to make entirely speculative in nature decades-long megaprojects over which developers have been given rights. All it takes is a change in the company’s financial condition or the economy and whatever “starry-eyed vision” the city accepted can change dramatically. Even with Forest City Ratner still technically on the scene there are no New York politicians who know what currently constitutes the project. That is, if they ever did. 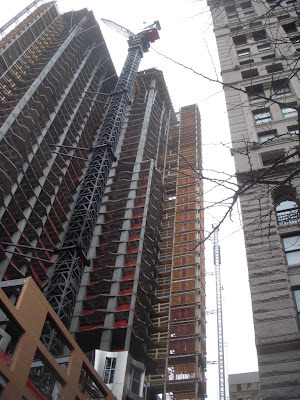 As City Councilman David Yassky recently commented “I don't think the project as put forward by Forest City Ratner and approved by the State is going to be built. There just isn't the funding for it. It doesn't work in this economy. It's really time to go back to basics and say 'what do we want at that site? '” (See: Atlantic Yards on BCAT. 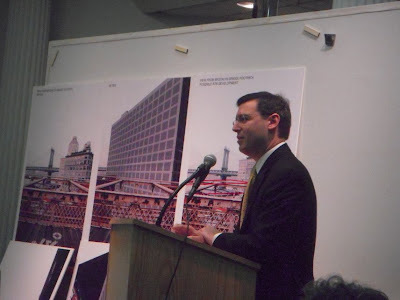 Councilman Yassky Makes Some Interesting Comments, 2.23.09) And people like William Thompson, the City Comptroller and candidate for mayor, are noting that they don’t know what the Atlantic Yards project is. The Atlantic Yards megadevelopment is totally undefined even though it is, in theory, much farther along than the Willets Point megadevelopment that is many acres more than Atlantic Yards. Perhaps the most defined aspect of Atlantic Yards, the proposed arena, is being subjected to such a total redesign-overhaul that it will be unrecognizable and unlike anything that was previously officially speculated about. The problem is that with an undefined project which has been given to a developer as a monopoly, the developer’s financial needs drive what the project is. That is unless and until the secret of what the project is goes with the developer/subsidy collector to their financial grave. 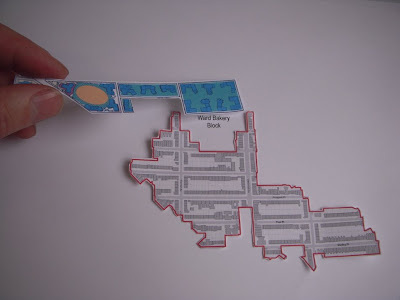 With these trade secrets intact, the developer/subsidy collector first designs the project to provide the level of private benefit and profit for themselves that they find satisfactory. At least in the case of Atlantic Yards, this level of private benefit was not weighed against the level of benefit that the developer designed the project to possibly deliver to the public. For a discussion of recent public agency testimony on this subject see: Missing a Leg To Stand On: ESDC Didn’t Consider Developer Profit, the Main Thing Atlantic Yards is About (Thursday, March 5, 2009). Gardeners talk about how dying plants parched for water and nourishment don’t curl up and die in the way that you might intuitively expect: Before they succumb, the dying plants put all their remaining resources and energy into flowering and seeding. Similarly, the financially parched Forest City Ratner, while doing little else right now (certainly not building) is reportedly spending huge sums on lobbying right now. All told when federal lobbying is added to the lobbying of New York state and local officials, the sum is assuredly exceeds a million this year. (See: Monday, March 16, 2009, Despite Atlantic Yards slowdown, Forest City Ratner spent $928,652 in 2008 on city/state lobbying. As people closely following the scandal know, AIG has been routing federal bail out money around the world and to Wall Street, essentially buying favor with big firms and banks by unnecessarily paying 100% on the dollar to extinguish collateral obligations which should have been extinguished with much lower negotiated discount sums. This has turned into windfall infusions of cash, a counterintuitive reward for financial companies who (foolishly?) placed their bets on AIG’s unregulated derivatives and CDO division being sound. As Develop Don’t Destroy pointed out, and a number of news organizations are following up upon, because Barclays Bank received substantial windfall moneys in this fashion that money is essentially funding the Barclays $400 million vanity advertising expenditure on the naming rights for Atlantic Yards arena. That vanity expenditure was likely to be cancelled and then Barclays received the windfall and extended its commitment to the name rights advertising. (See: Money: Taxpayers to AIG to Barclays to Ratner, 3.16.09, U.S. Taxpayers To Pick Up Tab for Barclays' Vanity Project, 3.17.09, Gonzalez: If Ever Built, Call It "American Bailout Arena" 3.17.09, Following the AIG Bailout Money to Brooklyn, 3.17.09, "U.S. Taxpayer Bailout for U.K. Bank Center", 3.09.09. Consider the similarities: Like Forest City Ratner, huge AIG was headed for bankruptcy. Essentially, AIG was bankrupt except for the fact that the government stepped into a subsidizing partnership relationship with AIG. Through its subsidies, the government owns 79.9% of AIG. Similarly, the government is subsidizing Atlantic Yards so heavily with taxpayer money that it is paying for substantially more than half of the $4.4 + billion price tag of Atlantic Yards. In each case we are discovering how rushed and badly thought out the government’s provision of subsidies has turned out to be. AIG’s undiscounted billions of dollars in payouts to banks like Barclays are an example of how poorly managed the AIG government subsidies are, but people probably understand the problem reflected in the case of the AIG “retention bonuses” better. Let’s look at the roots of the problem. First, AIG insiders made a bet that the government would not let AIG fail, that the government would step into the trap of a debilitating subsidy bear-hug. (Had the government let AIG go into bankruptcy any “bonuses” could have been restructured out of existence.) Second, the AIG insiders used their inside advantage and knowledge to stay a step ahead of the government in engineering a diversion of government subsidy funds to their personal benefit. The evidence in the case of AIG? At the time the contracts were written for the “retention bonuses” it was clear that AIG was headed for a bad year. We would expect that somebody in the know would have understood that AIG was very likely tubing. The contracts were written by insider-drafters to protect insider-recipients of the bonuses by specifying that if (as certainly turned out to be the case) 2008 was a worse financial year than 2007 the bonus payments would be no less than they had been in 2007. Though the bonuses were officially “retention bonuses” they went also to individuals who left the firm. As Hank Greenberg, former head of AIG (who was forced out after an Eliot Spitzer investigation) pointed out on Charlie Rose Tuesday night, the bonuses vitiated the purpose of provisions pursuant to which the special AIG unit had been set up that were structured so that the profits (or lack thereof) of people in that AIG unit would be at risk if there was poor performance. Similarly, Forest City Ratner is hoping that the government will enter into a self-defeating subsidy bear-hug even if it is turning into a zombie developer. The theory with AIG was that sufficient additional “havoc” would be wreaked if AIG was not saved. Similarly Forest City pursuing a BYOB (“Bring Your Own Blight”) policy has done everything it could to make a hole in the ground big enough so that politicians could be convinced that they had no other choice but to accept its zombie subsidy bear-hug. (See: December 3, 2008, Lessons from the Ward Bakery demo. *) This is the logic the city is setting up for at Willis Point as well. Here is the second, perhaps more sobering thought: A.I.G. built this bomb, and it may be the only outfit that really knows how to defuse it. The way in which the retained AIG staff unnecessarily paid out windfall payments to banks like Barclays on an undiscounted, unnegotiated basis belies Mr. Sorkin’s theory. Besides, the AIG personnel involved had previously demonstrated their incompetence (many didn’t stay around anyway); they have now throughly demonstrated their venality and, in a tremendously down Wall Street market, there are more than enough competent individuals to easily hire more competent replacements. . . . . executives and bankers had an incentive to create rules that would reward them no matter what. The country is now living with the consequences. So any attempt to build a new financial system, one that’s less susceptible to bubble, bust and bailout, will have to include a new approach to pay. Throughout this crisis, policy makers, starting with President George Bush and Ben Bernanke and now including President Obama, have been a bit too deferential to Wall Street. While it is important to have a world where contracts are honored, the self-serving background under which these contracts were crafted certainly provides grounds for their repudiation. That is what President Obama, his Treasury Department officials and just about everyone else are now calling for. The contracts ought to be void as against public policy since they were premised upon an expectation (and actually required) that the government would rescue AIG from bankruptcy to protect the public from the jeopardy the AIG division manufactured. The self-serving “contracts” with zombie developer/subsidy collector Forest City Ratner respecting Atlantic Yards ought to be similarly repudiated. There are probably even more grounds and reasons for doing so than with the AIG retention bonus contracts. (See: Friday, December 26, 2008, A New Year’s Revolution List (Starting 2009 Off Clean: Pull the Plug On Atlantic Yards)) We think that politicians who are not exploring these options are behaving in fashion similarly tone-deaf to the earlier behavior of Timothy Geitner and his staff. What is the Bloomberg administration likely to do? It seems that the primary goal of the Bloomberg administration in situations like Atlantic Yards and Willets Point is not to build particular projects for which it has only “starry-eyed visions” but only to put large tracts of property into the hands of monopoly developers. It is likely that the Bloomberg administration will not want to pull the plug on these transfers until such limping developers have reached the ultimate nadir of a complete and total financial demise. We should note that super-large megaprojects reduce to a very small club, the list of “competing” developers that might (and sometimes don’t actually) “bid” for the development. After our Will It Come series it was reported how the original list of eight potential monopoly developers for Willets Points had dwindled to five, partly by reason of Forest City Ratner’s financial debilitation, and that a realistic appraisal probably thereupon reduced that list to what may be only two developers. (See: Friday, December 19, 2008, Let's take a look at the Willets Point finalists, part 1. and Tuesday, January 27, 2009, Let's take a look at the Willets Point finalists, part 2) Our own guess is that despite its recently reported problems, Muss Development probably still considers itself in the running. Should they? These short lists of what must be very big developers means that every developer on these lists is likely to have exceptional access directly to the mayor. New York City cannot take Petitioners' businesses, property and homes based solely on the assertion that the future use of the property -- whatever that might be -- would be for a public purpose. Though the part of the Willets Point petition focusing on the city’s lack of defined public purpose in condemning Willets Point is the part that interests us most, we are not surprised by how much more of the legal petition focuses on the city’s failure to properly follow environmental review procedures. We are not surprised because our state and city government don’t seem to want New York citizens to have protective rights against government-assisted takings under either the Bill of Rights of either the federal or state constitutions. And our courts often don’t seem to want to contradict these abusive government inclinations. Therefore, challenges to environmental process almost have to serve as a stand-in for the better constitutional protections we lack. It is also not surprising because the lack of public purpose driving these land transfers to developers generates associated flaws in the environmental process. 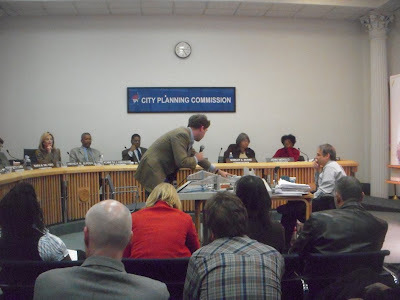 Because the city transfers of sections of the city to monopoly developers have a different relationship with the determination of public purpose than they are supposed to, they treat the environmental review process as if it is a forgone conclusion rather than a deliberative process weighing and exploring relevant facts. Accordingly, the transfers flirt with disastrous flaws and attorney Michael Gerrard did a good job of identifying such flaws with respect to Willets Point. The Deputy Mayor for Development’s Office Environmental Responsibilities: And How Was an Odd Grab of Power Exercised? . . .the Deputy Mayor's Office is not even a proper lead agency, since it lacks the power to fund, approve or directly undertake the Development Plan. Indeed, the Deputy Mayor's Office has not even issued a statement of findings as required by SEQRA and CEQR. Even if it were a proper lead agency (and it was not), however, the Deputy Mayor's Office also failed to perform the paramount function of a SEQRA lead agency: it failed to take a hard look at a number key environmental impacts of the Development Plan. The NYC Charter and Code do not vest any powers in the Deputy Mayor's Office -- rather, the Mayor must vest powers in the Deputy Mayor. See New York City Charter § 7 ("The mayor shall appoint one or more deputy mayors with such duties and responsibilities as the mayor determines."). Upon information and belief, there has been no applicable delegation of power to the Deputy Mayor's Office. Even if there were, it would not be sufficient to authorize the Deputy Mayor's Office to serve as lead agency, since under applicable precedent the role of lead agency is non-delegable. E.g. Coca-Cola Bottling Co. v. Board of Estimate of the City of New York, 72 N.Y.2d 674, 536 N.Y.S.2d 33 (1988). We have noted the ongoing problems the mayor’s office has with conflicts of interest and delegations of authority when it comes to the large real estate transactions going on in New York. (See: Monday, February 2, 2009, The Good News IS the Bad News: Thanks A lot for Mayor Bloomberg’s “Charity”.) It would be too time-consuming to review them again here but one of the major concerns in this regard is about what kind of quid-pro-quoing could possibly be going on in the mayor’s office either directly or through his deputy mayors. The Office of the Deputy Mayor for Economic Development is representing the City, which is undertaking this initiative, issuing the developer RFP, selecting the developer, and providing funding, and thus is the appropriate lead agency for this project. Why would a city administration office that is incapable of taking a hard look at the environmental impact statements and which neglects to follow through with the required findings thereunder, be selecting the monopoly developer for a 75-acre swath of city acreage? The lawsuit says that the Deputy Mayor’s Office failed to properly disclose significant, unmitigated adverse impacts to regional highways as well as failing to properly disclose the approval process for highway modifications, suggesting that (as is probably so) the city hasn’t even started the process of obtaining state or federal approvals. 61. One example of the severity of the impacts can be seen in the traffic on the ramp from the westbound Northern Boulevard to the southbound Van Wyck Expressway. Even on days without baseball games, a comparison of data tables in the FGEIS indicates that traffic on the ramp will drop during the weekday afternoon rush hour from 28.9 mph to 1.4 mph (!). (Ex. 1, FGEIS at 17-73, 17-77.) In other words, a person walking at an average speed of 3 mph wouldmove twice as fast as a car on the ramp. 84. When these concerns were presented to the Deputy Mayor's Office, however, the Deputy Mayor's Office refused to evaluate them. Instead, the Deputy Mayor's Office offered – without supporting data or studies -- the extraordinary response that emergency services would not degrade at all. 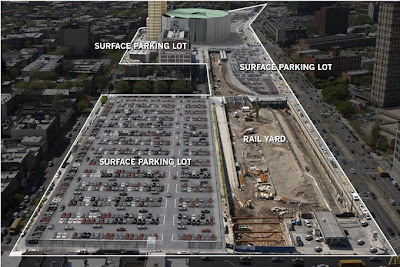 If, as appears, the city is incapable of envisioning the plan it wants for Willets Point with enough clarity to conduct a proper environmental review that can pass muster, perhaps the city should just plan on replacing Willets Point with a giant parking lot. 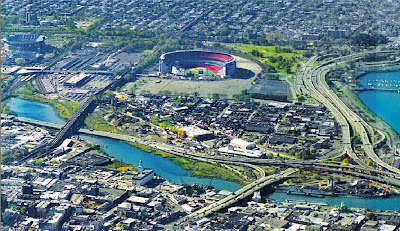 After all, if Robert Moses had been allowed his wish Willets Point would have been turned into a parking lot for Shea Stadium though, now that it has survived about three-quarters of a century, Willets Point has succeeded in outliving Shea Stadium, just demolished, which was in use for only 44 of those years. Can it be? Is it possible that when the city speaks in terms of "starry-eyed visions" it is content when it gets parking lots instead? The other day we found ourselves in a waiting room where there were two pals, about 65 years old, talking. They were both professional baseball scouts. One of them had Hall of Famers to his credit. It has been a while since we had a strong personal interest in professional baseball. The interest we had fell away after our younger years: Rather than watching, we prefer the sports in which we actually engage and if we don’t have to get two teams together to get started so much the better. Still, there is a certain amount of fascination listening to “inside baseball” and our ears perked up all the more when the chat of these two fellows touched upon one of our Noticing New York urban planning concerns, the financing of Yankee Stadium. . . . . the Bloomberg administration paid a very, very high price for a “free” luxury suite for its own use at Yankee Stadium including, but not limited to, giving the Yankees 250 parking spaces in exchange. Not only has the public financing of the stadium cost taxpayers an inordinate amount of money, but it has also been commented that the final product is costing the baseball fans a lot more. Our testimony this time was essentially the same as last time, confining itself to the error of bundling approval of the project with the community’s opportunity to get a new school. This time, however, we had the opportunity to also attach to our handed-in written statement, a copy of our above referenced post which, not being subject to the three-minute oral testimony limit, provided additional analysis about how the Brooklyn Bridge should be revered as special while the Dock Street developer should not be made special, and made the case that the Brooklyn Heights Association’s opinion that a new school should go elsewhere is probably correct. Others also similarly reprised their testimony. Testimony in opposition to the project predominated. We wondered whether Markowitz’s “compromise” was an example of what we see as the increasingly ubiquitous politicians’ dance, with politicians inevitably providing support for special projects but only after there has been a reduction from what a developer has requested. Accordingly, these dances always seems to be initiated with developers requesting more than they reasonably expect, sometimes with conspicuously awful proposals up front that allows the politicians to heroically claim credit for forcing a subsequent cut-back. We wondered about this all the more because at the Brooklyn Heights Association meeting Borough President Markowitz specifically said that his approval had not been influenced by the proposed inclusion of a new middle school, which he said had to stand alone as a separate decision he couldn’t comment upon. He thereby directly addressed our Noticing New York testimony given at the hearing he held. But if he was not being influenced by the school’s inclusion, why was he now favoring a project that was otherwise so substantially similar to a prior edition of that project which he had rejected? There was a certain element of suspense to the hearings because the borough president’s proposed compromise had been released such a short time before the commission’s hearing. Our suspicion that this was a political Kabuki dance was challenged (though perhaps not refuted) by the negative reactions it received. The Brooklyn Paper observed that the proposed compromise united everyone, developer included, in opposition. 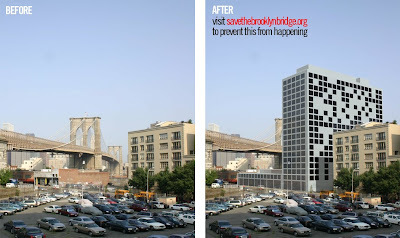 (See: March 5, 2009, Marty’s taller Dock Street tower unites everyone — against it, By Ben Muessig, The Brooklyn Paper.) It may have generated negative reactions, but by proposing a compromise the borough president did something less than oppose the project outright. We were pleased to see that City Councilman (and candidate for Mayor) Tony Avella testified eloquently against the project and the travesty of obliterating views of the bridge. You can expect Mr. Avella to be dependably on the right side in so many issue like this. City Councilman (and candidate for Comptroller) David Yassky also testified against the project mentioning that there were better places to put the proposed school. 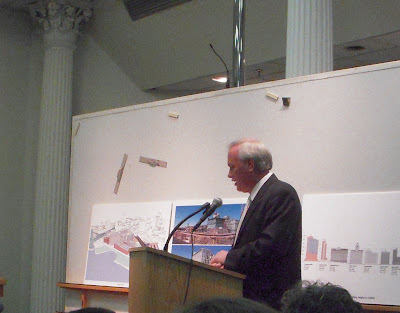 A model of the project in the DUMBO neighborhood brought to the hearing by the developer was discussed, as were renderings brought by representatives of the DUMBO neighborhood Association (see the rendering behind Mr. Yassky in the photo where he is testifying). 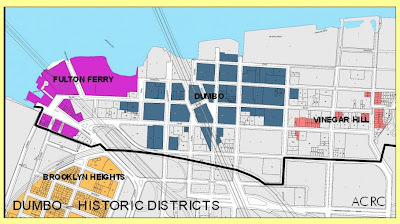 The question arose as to whether they showed the same thing and specifically whether the renderings provided by the DUMBO Neighborhood Association were fair. We think they were fair based on photos we took of the developer’s model that essentially duplicated the DNA renderings. We refer you to the picture of the model at the beginning of this post as it compares to the rendering behind Mr. Yassky. 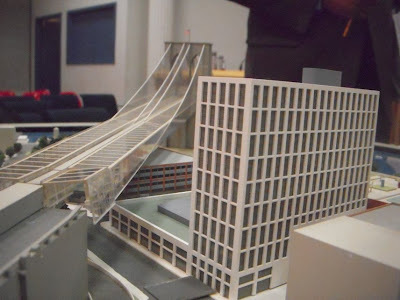 We could not precisely duplicate the image because we could not get the camera to a postion as low as the level of pedestrian walkway and could not get the lens of the camera as close to the model of the proposed project as a person standing on the walkway would be. If we had been able to, the new proposed structure would loom larger in the photograph with more stories below the rooftop being visible. 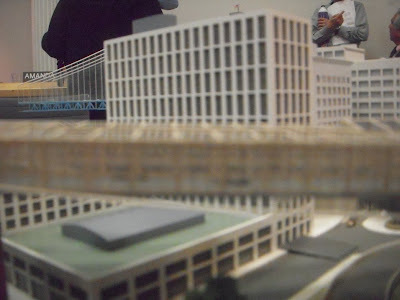 When we were taking pictures of the model, a representative of the developer was suggesting that how many floors of the building can be counted is important. Raising our camera up it was clear that the new building was blocking views of the same Manhattan Bridge tower and buildings as shown in the before-and-after DNA renderings. The community’s argument is that they want to continue to be able to see the Brooklyn Bridge and to see a sweep of historic Brooklyn from the bridge. The suggestion is that there should be preservation of a bowl-shaped view such as now exists with low buildings close to the bridge and taller buildings farther away. 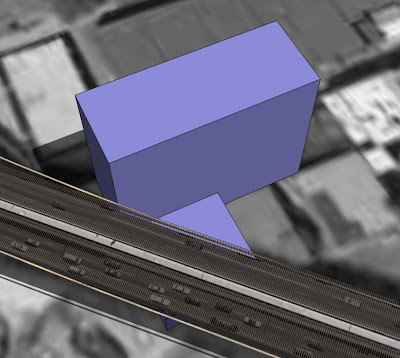 The developer’s arguments dispense with these desires and argue that his new building should be considered a contextual addition to the historic neighborhood if it is of comparable height to buildings which, because they are substantially farther away, do not crowd the bridge. Can the outcome be predicted? On one side, opposing the project you have Pulitzer Prize and National Book Award winning, historian David McCullough, author of The Great Bridge: The Epic Story of the Building of the Brooklyn Bridge, standing together with virtually every recognized neighborhood and historic organization from the national level on down to the local level. The only exception is that the Pratt Institute did not take the postion in opposition to this project that one would normally be expect them to take. There are few icons like the Brooklyn Bridge, and the alliance of luminaries like McCullough and all the heavy-hitting premier historic organizations should, under normal circumstances, predict success for the opposition. On the other hand, there are some competing indicators. When it comes to politics a good guiding axiom is that “there are no such things as coincidences.” Maybe coincidences do exist, but in politics you are better off assuming that anything that looks like a coincidence is not. The hole is even more apparent when you remember that the Brooklyn Bridge is itself an individual landmark and that the presence of the new Brooklyn Bridge Park means that the historic landmarks and districts where they otherwise don’t continue abut parkland. So, predictions anyone? David McCullough and the powers of light and enlightenment on one side and some interesting political “coincidences” on the other.